He was born on a chilly spring morning on March 30th, 1970 at the Thoroughbred breeding farm, Meadow Stables, in Virginia. Owned by self-proclaimed housewife Penny Chenery, this magnificent bright red stallion would top out at 16.2 hands, 1,200 pounds, and become perhaps the greatest racehorse ever. In the year of his 37th anniversary of winning the Triple Crown, and especially with the new Disney movie about him to be released this Thanksgiving weekend, editorial intern Amie Peck and I thought it would be fun to give you 11 facts you may not have known about this lightning bolt on four legs. 1. 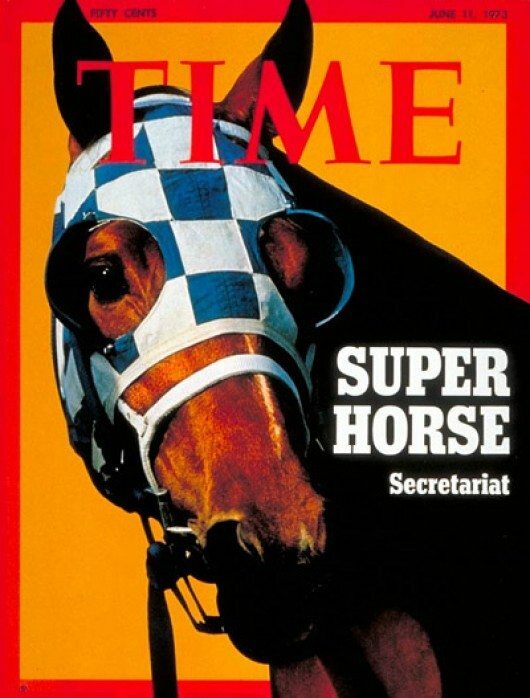 Secretariat was the only horse in history to grace the cover of Time Magazine, as well as Newsweek and Sports Illustrated – all in one year! 2. Secretariat has an indelible Canadian connection. His final race was at Woodbine Racetrack in Toronto on October 23, 1973, and it was held in tribute to his Canadian trainer, Lucien Laurin and his Canadian jockey, Ron Turcotte. 3. He was the first Triple Crown Winner in a quarter of a century, winning the title in 1973. Previous winner was Citation in 1948. 4. 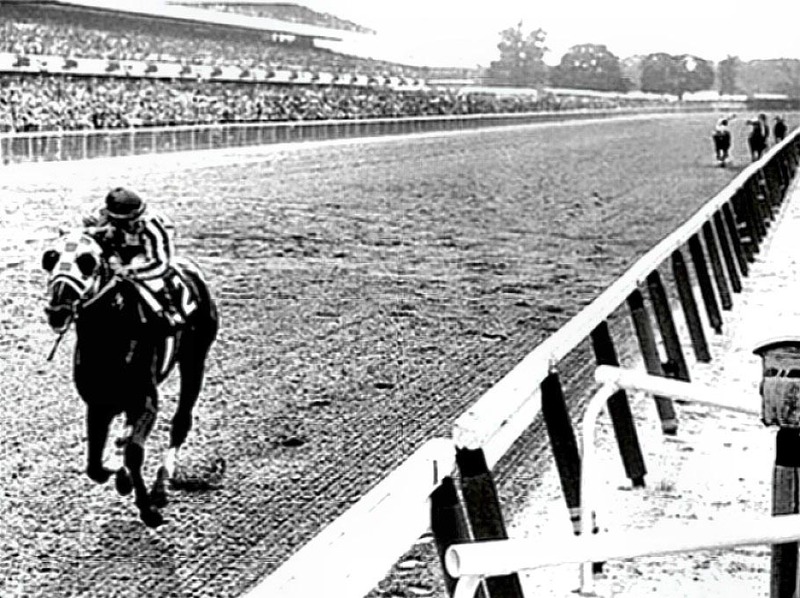 Secretariat set track records for each Triple Crown Race: the Kentucky Derby, Preakness, and Belmont Stakes. He has also set two world records. 5. Secretariat won the Belmont Stakes in a record breaking time of 2:24 at 1.5 miles – a record which still stands today, and many argue stands little chance of ever being broken. When he crossed the finish line, he was an estimated 31 lengths (the length of one horse) ahead of his closest competitor. Back on June 9th, the 37th anniversary of the running of this incredible race, I posted footage of the race on the Western Horse Review Facebook Page and a reader pointed out jockey Ron Turcotte looking back over his shoulder in the backstretch, because he could no longer hear any other horse behind him. If that doesn’t make your spine tingle. . . .
Secretariat winning the Belmont Stakes, by 31 lengths, in 1973. 6. He was the first horse to have a publicity agent who brokered his appearance and endorsement contracts. “Big Red” was as hot as any movie star. 7. He died of Cushings related laminitis at the young age of 19. 8. Secretariat was named Horse of the Year at just two-years-old – before he ever attempted the Triple Crown run – a very rare honour. ESPN also placed Secretariat in the 35th slot of their countdown of the top American athletes of the entire century, right between Lou Gehrig and Oscar Robertson. 9. The ownership of Secretariat was determined by a coin toss. There was an agreement between Meadow Stable and Claiborne Farm that each year a coin would be flipped to determine who would own the newborn foals. The year Secretariat was born, Meadow Stable won the coin toss. Pretty good luck, eh? 10. 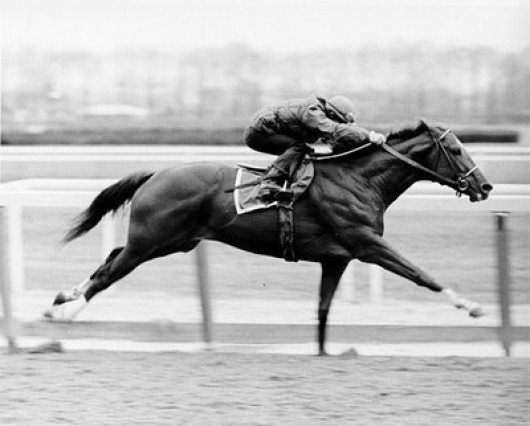 Unlike the Grinch, whose heart was two sizes too small, during the autoposy of Secretariat’s body, it was found that his heart weighed 22 pounds; the average horse heart is eight pounds. This was partly attributed to his tremendous racing ability, and proved what everyone had always known about him – he had incredible drive and heart. 11. 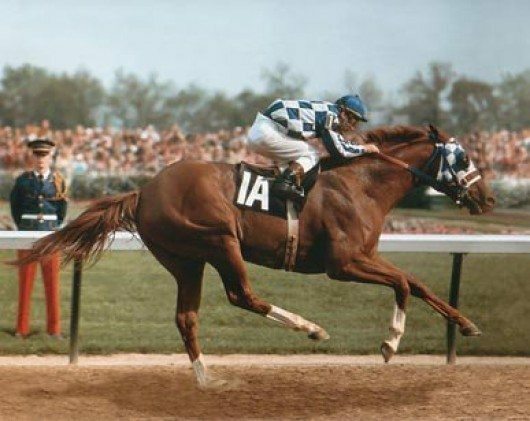 As part of a deal to help the financially ailing Meadow Stable, Secretariat was sold to a breeding syndicate for a then-record price of $6.08 million. Although he sired some champions, his own incredible athleticism was never equalled in an offspring. Lastly, we leave you with the trailer view of Secretariat, starring Diane Lane, John Malkovich and Margo Martindale. In the movie, Secretariat is played by four horses – three Thoroughbreds and one Quarter Horse. 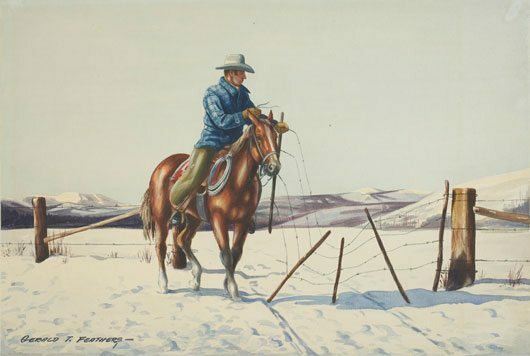 Apparently, on set, a make-up crew spent the better part of most mornings painting matching socks and the original’s distinctive white stripe on each of the four horses. 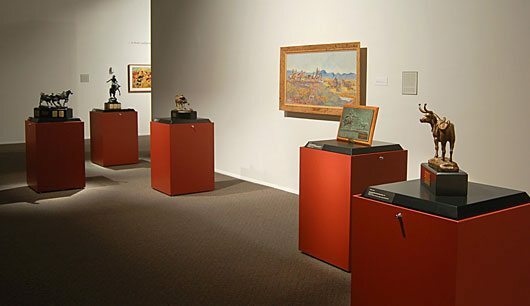 For those who grew up on Roy Rogers, Dale Evans and of course, the famous palomino, Trigger, today marks an historic day as New York Auction House, Christie’s began this morning to auction off most of the memorabilia which was once housed in the Roy Rogers and Dale Evans Museum, now closed. Included in the auction is such pieces as this toy sculpture of Roy and Trigger, found atop a General Store in the museum. 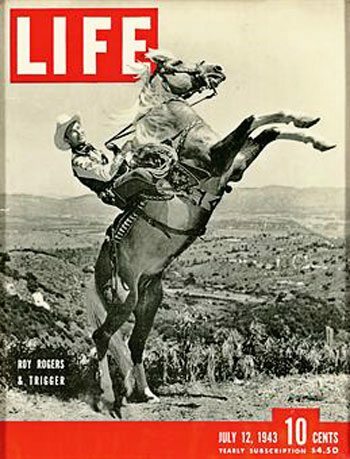 Christie’s estimates the selling price at $600-$800 U.S.
Or, this framed LIFE magazine, with Roy on a rearing Trigger dated July 12, 1943. Classic car buffs may have a hankering for Roy’s Bonnyville, which displays his own sense of incredibly wild style, as well as his hankering for . . . firearms. 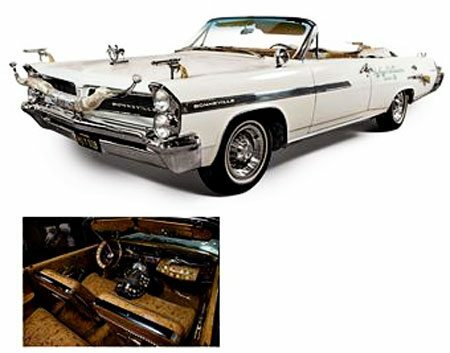 Turn signals and door handles were converted into guns, and silver dollars were embedded into the side walls and dash board. (Christie’s wants you to know that “all firearms attached onto or inside of the “Roy Rogers Bonneville” have been rendered inoperable through alteration, modification and/or extensive chrome plating. They should no longer be considered firearms but decorative pieces. Furthermore, the cartridge belts are adorned with safe, non-functioning bullets made from real components.”) Good to know! Legend has it Rogers had an eight-track machine installed under the seat, and kept it loaded with an eight-track of a cattle drive. He’d drive up to an intersection at a four-way stop, then project the sound of the eight-track through a bull horn he kept in the car. People nearby would hear this stampede going through and look around in confusion. Bit of a practical joker, our Roy. Of course, most likely to cause the greatest commotion at the auction is the original, stuffed Trigger. 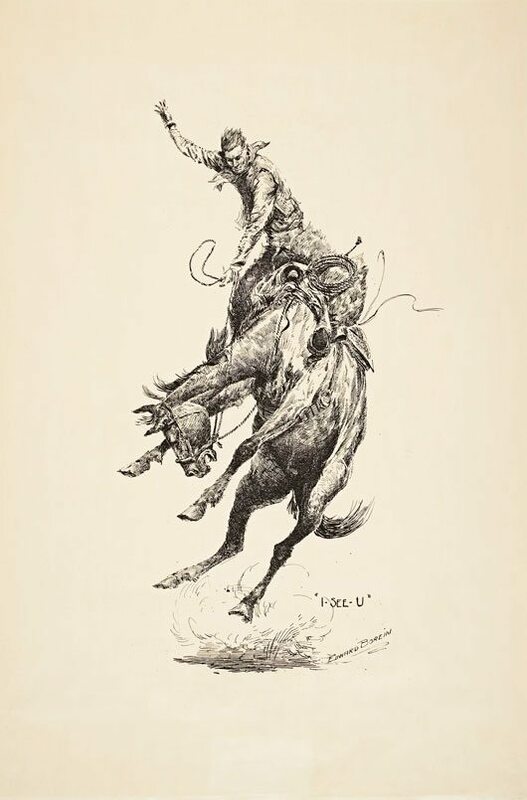 You might remember Roy’s sidekick, the palomino Quarter Horse, Trigger. Rogers and Trigger spent the better part of two decades together and the movie star became indelibly attached to the horse. 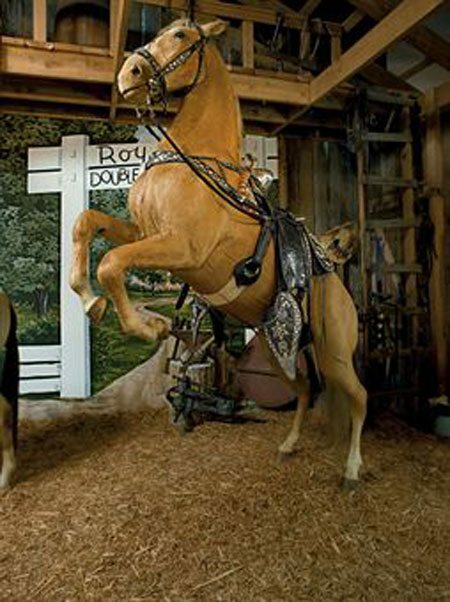 So much so, that when the horse died, one day short of his 31st birthday, Rogers was unable to “put him in the ground,” and amid some true controversy of the day, elected to have the horse stuffed and put on display at the Roy Rogers – Dale Evans Museum, then located in Victorville, California. 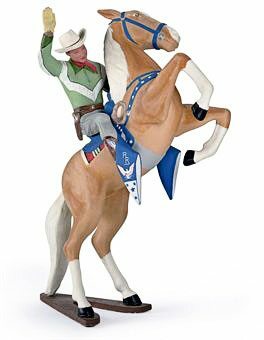 Christie’s estimates the life-size stuffed Trigger will auction off for between $100,000 and $200,000. Apparently, Roy never used spurs or a whip on Trigger, and the horse was trained to respond to simple movements and cues. 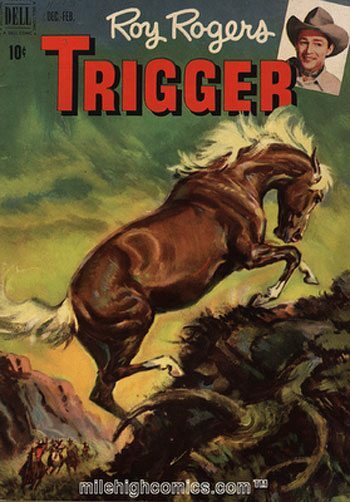 Trigger became known as one of the smartest horses in the history of show business, performing hundreds of “tricks” on request such as doing the hula, untying ropes, shooting a gun, knocking on doors and walking on his hindquarters. Although Roy Rogers, Dale Evans and Trigger were a bit before my time, I’m as familiar with them as if I had grown up watching them on the television. We’ve simply heard, read and been told so much about them. They are an unforgettable timepiece in our western culture, signifying an era when boys and girls held such characters as their heroes, and dreamed of growing up to be just like Roy, and owning a horse just like Trigger. It must be a bit sad for many, seeing this bit of western – albeit Hollywood history – disburse today. See the collection and watch the live feed at Christie’s. 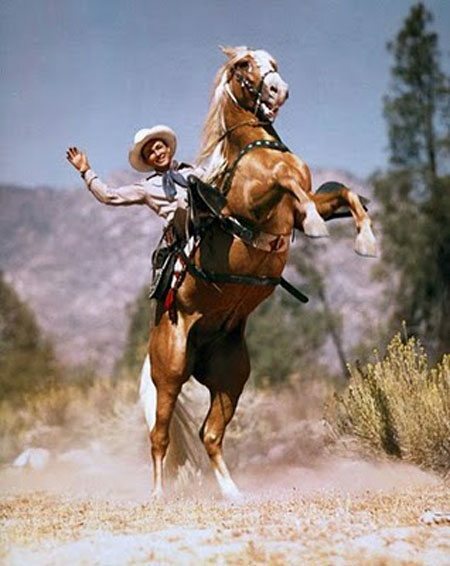 And in the meantime, enjoy this look back at Roy Rogers and Trigger, starring in the movie, Son of Paleface. 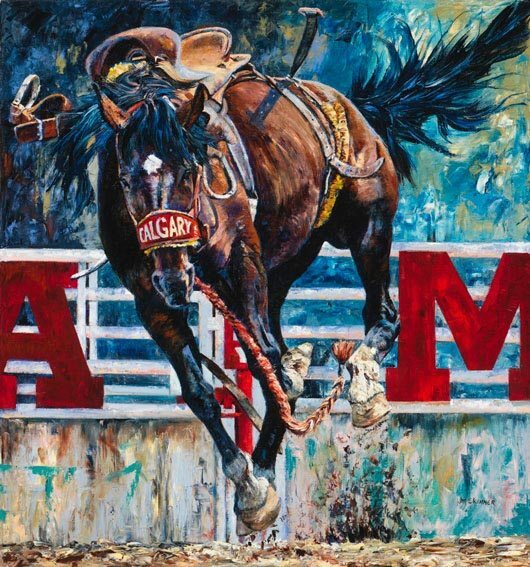 Starting today, 400 barrel racers will arrive at the Ponoka, AB Stampede Grounds for the 40th Anniversary Dee Butterfield Alumni Barrel Race which will run July 8 – 10. An icon in Canadian Barrel Racing circles, Dee Butterfield continues to enjoy a very successful career. To date the B.C. 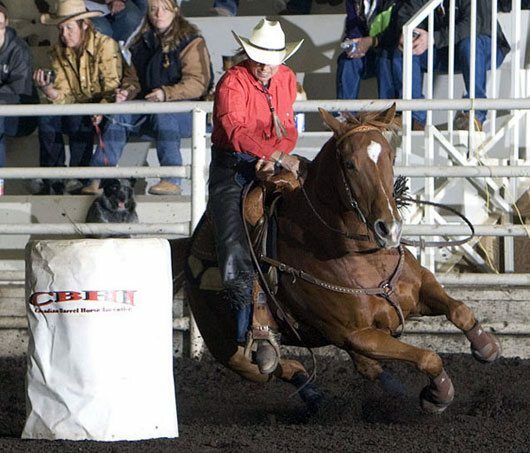 ranch-raised cowgirl, who resides just northwest of Ponoka, AB, has earned 15 amateur barrel racing titles, 11 Canadian Finals Rodeo qualifications, four CPRA season leader titles and a National Finals Rodeo qualification. Dee won a Canadian Barrel Racing Championship in 1992. A talented trainer and quarter horse breeder as well, Dee has accumulated multiple futurity and derby championships spanning four decades. Always willing to help other competitors, Dee began instructing barrel racing and horsemanship clinics at the age of 18. The year 2010 will mark 40 years that she has held these informative clinics across Western Canada, Australia, and Hawaii. Teaching the fundamentals of the sport, inspiring training and riding skills with an emphasis on the importance of developing a winning attitude, Dee has helped students go on to win at amateur, high school, little britches, junior and professional levels. Some students have become provincial, state, and national champions. Dee’s clinics are suitable for riders of all levels and ages. Dee’s youngest student to date was four and the oldest, 65. One student has attended the clinics off and on for 34 years. Dee has enlisted the help of family and friends for what promises to be an exciting weekend. Several tractors will be on hand to ensure ground conditions remain excellent for all. Numerous sponsors are supporting the event, and the weather promises to be sunny and warm. Check back for results/photos in a later Barrel Patch blog. If I make it to Ottawa anytime before the end of 2010, one visit I won’t miss is to the Canadian Museum of Civilization for their newly installed The Horse exhibition, which premiered May 28. The must-see exhibition follows the evolutionary path of the horse, both before and after it was domesticated by humans 6,000 years ago. In that time, we have developed more than 200 breeds whose size, shape, strength and disposition make them suited to specific activities. The Horse showcases fossils and skeletons, prehistoric cave art and contemporary sculpture including this amazing piece by Saskatchewan artist Joe Fafard. I was fortunate enough to catch a view of this sculpture at the Glenbow Museum in Calgary a number of years ago and I can attest it is incredibly awe-inspiring up-close and life-size. Fafard’s spectacular horses give us an exhilarating sense of speed and grace moving over the land. They capture the spirit of a creature that makes the human heart beat faster and makes us long to run with it. 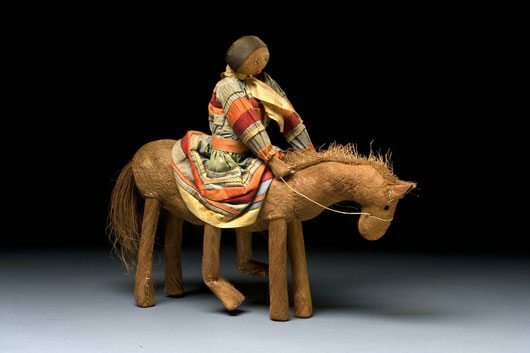 Also featured are ancient toys such as this horse doll which originated from the Big Cypress Seminole Indian Reservation in Florida. 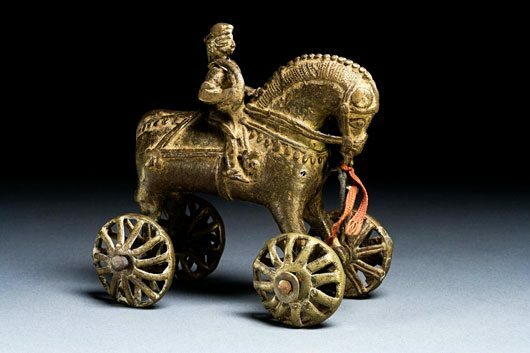 Or, this toy brass horse with a soldier riding on top from India. Simply magnificent isn’t it? I wouldn’t miss this vintage photo – the original of the world renowned series of photos where the gallop was first dissected. 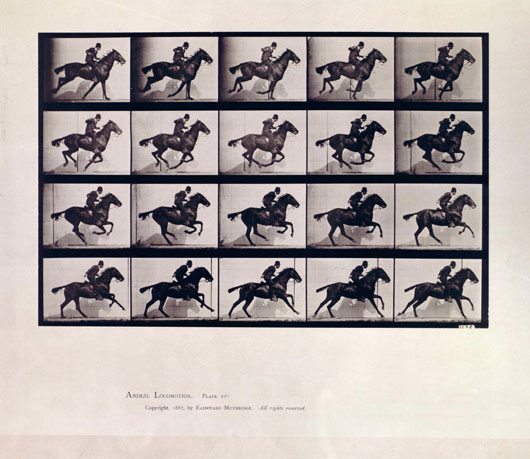 In fact, pioneering British photographer Eadweard Muybridge (1830–1904) was the first person to freeze the movement of a running horse in a series of still photographs. 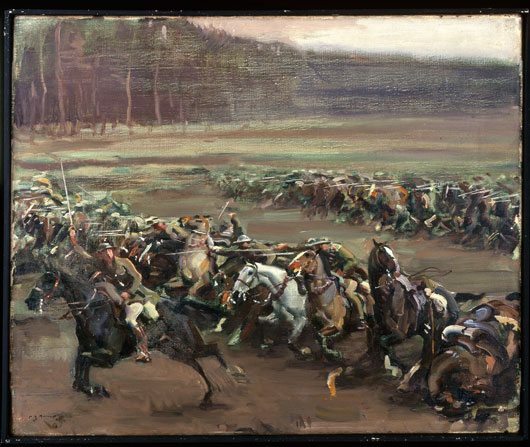 He set up rows of cameras that snapped pictures as the horse moved past. In the gait known as the gallop, all four feet leave the ground, but not when the legs are outstretched, as you might expect. Instead, the horse leaves the ground as its hind legs swing closest to the front legs, as this photo shows (second row). Here’s an incredible piece of history I knew nothing about, entitled Charge of Flowerdew’s Squadron. In 1918, to stop the rapid advance of a German force at Moreuil Wood near Amiens, Lieutenant Gordon Flowerdew led a charge of the Canadian Cavalry Brigade. They won the battle that day, but half the squadron was killed, including Flowerdew (who was posthumously awarded the Victoria Cross), and 800 horses. 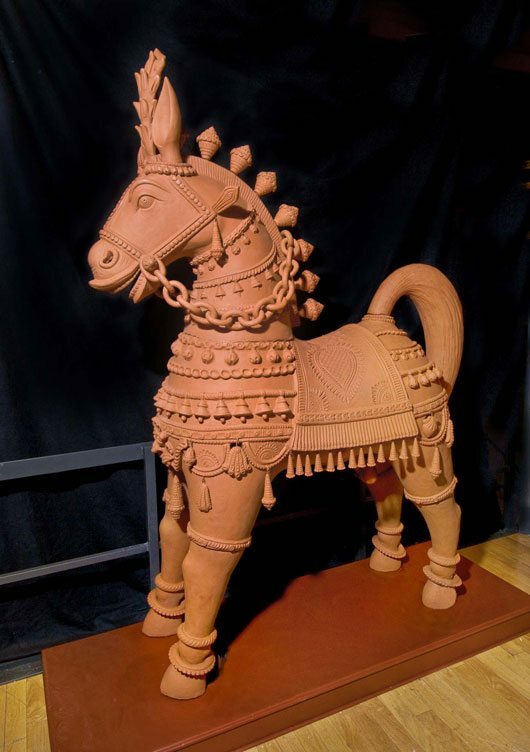 Then there’s this amazing terra-cotta horse. In the state of Tamil Nadu in southern India, village potters create horse figures as offerings to Aiyanar and other local gods, who are said to patrol village borders and protect people from harm. Many village shrines contain hundreds of these votive horses, just imagine, some standing more than five metres (16 feet) tall. This horse is trimmed with garlands, like the stone horses in grand Indian temples. The face on its chest is Yalli, a spirit that protects Aiyanar. 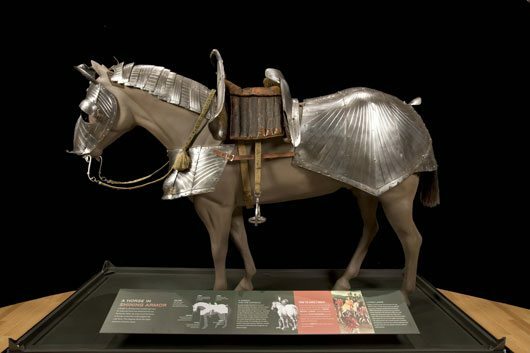 My last piece of horse history eye candy for you today is this life-size German horse armour which includes: the chanfron, which covered the horse’s head and carried the rider’s family crest or coat of arms; the crinet, which protected the horse’s neck and was made of overlapping plates so the horse could move its head; the crupper, which shielded the horse’s hindquarters; the saddle, which kept the rider’s waist safe from lances, spears and arrows; and the peytral, which was worn over the horse’s chest and raised or flared outward to provide freedom of movement for the its legs. Luckily we don’t have to worry about catching last minute trains, planes or buses to take in this once-in-a-lifetime exhibition. 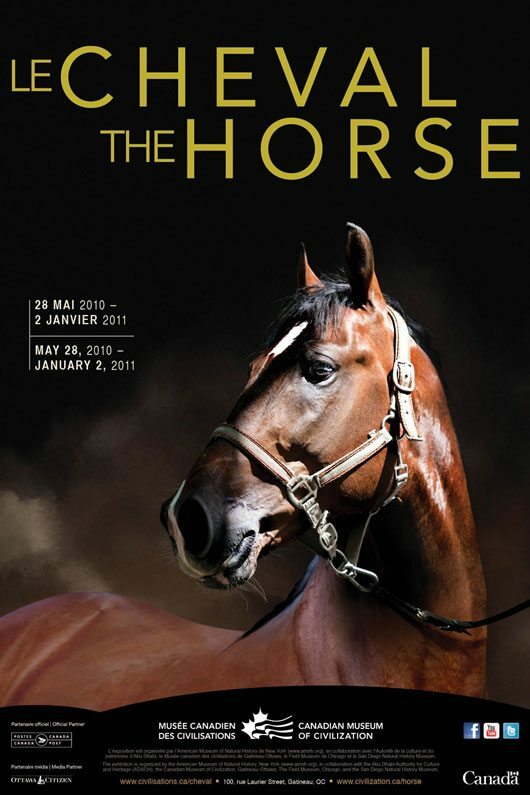 We have a bit of time as The Horse will be presented until January 2, 2011. Remember, it’s at the Canadian Museum of Civilization, in Gatineau, Quebec.